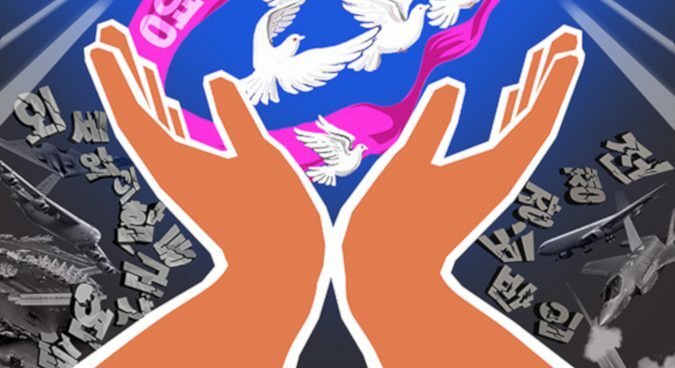 In a first since U.S.-DPRK denuclearization negotiations began last year, a North Korean propaganda poster released in state media Sunday featured imagery promoting the removal of U.S. military assets from the Korean Peninsula. 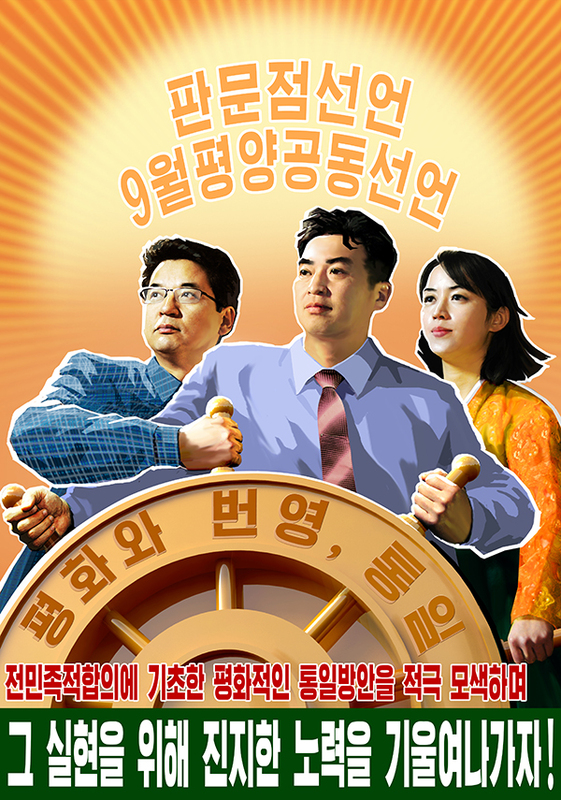 Released through state outlet Uriminzokkiri as part of five new posters – all themed around unification and featuring slogans pulled from Kim Jong Un’s recent 2019 New Year’s Address – one brings back the familiar anti-U.S. theme which disappeared from official propaganda following the start of the inter-Korean detente in early 2018. 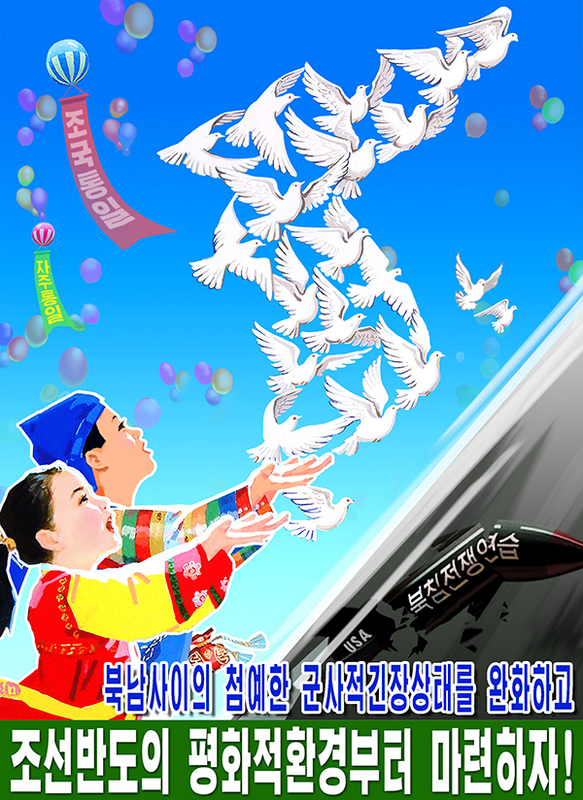 A jet fighter and a surface-to-air missile launch resembling the U.S.’s THAAD system – currently operational in South Korea – are show in the new poster under the words “introduction of war equipment,” in the thematic, broken font typically used in North Korean propaganda to symbolize a defeated enemy, though the U.S. is not explicitly labeled as it has been in past examples. 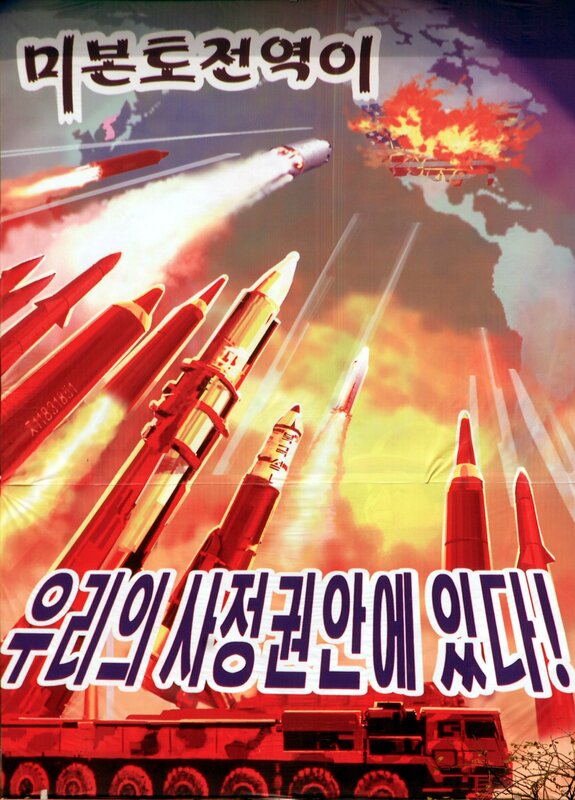 On the other side of the poster, the same broken font reads “joint military exercises with foreign forces” over what appears to be a U.S. stealth fighter, B-52 Bomber, and an aircraft carrier, echoing but also expanding upon past calls to end “war practice” in past posters. In his recent New Year’s Address, Kim said this goal was the country’s “steadfast will,” and elaborated upon the demands for removal of U.S. military presence in South Korea, again without specifically mentioning the U.S. or other nations involved in joint military drills. “Given that north and south committed themselves to advancing along the road of peace and prosperity, we maintain that the joint military exercises with foreign forces, which constitute the source of aggravating the situation on the Korean peninsula, should no longer be permitted,” Kim said in the address. “The introduction of war equipment, including strategic assets from outside, should completely be suspended,” he added. An article in Uriminzokkiri from January 11 clarified that the goal “to end U.S.-south Korea joint military drills” was a prerequisite to “the realization of peace on the peninsula,” following from the slogans in Kim’s New Year’s Address. 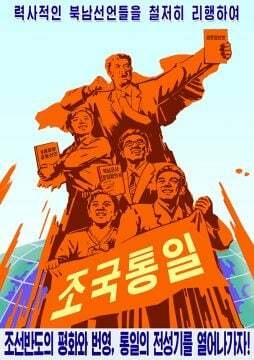 The new posters represent a condensed version of the demands Kim made towards North Koreans in this address, and are expected to be put up around Pyongyang and elsewhere in the country in the coming days and weeks. 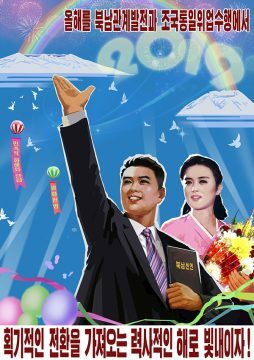 The last time a series of new official DPRK propaganda posters featured such subtle references to the U.S. was in May last year, when tractors were shown mowing over barbed wire separating the Koreas as well as a bomb with the words “North Korean nuclear war invasion practice,” without naming a country. 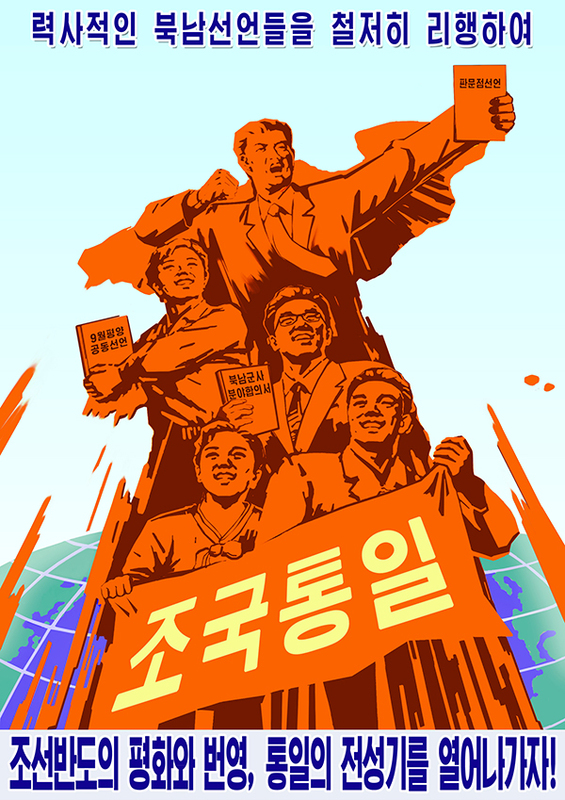 In January 2018, as part of a similar series of unification-themed posters, “outside interference” and the “USA’s practice for a war to invade North Korea” were also shown as broken text. 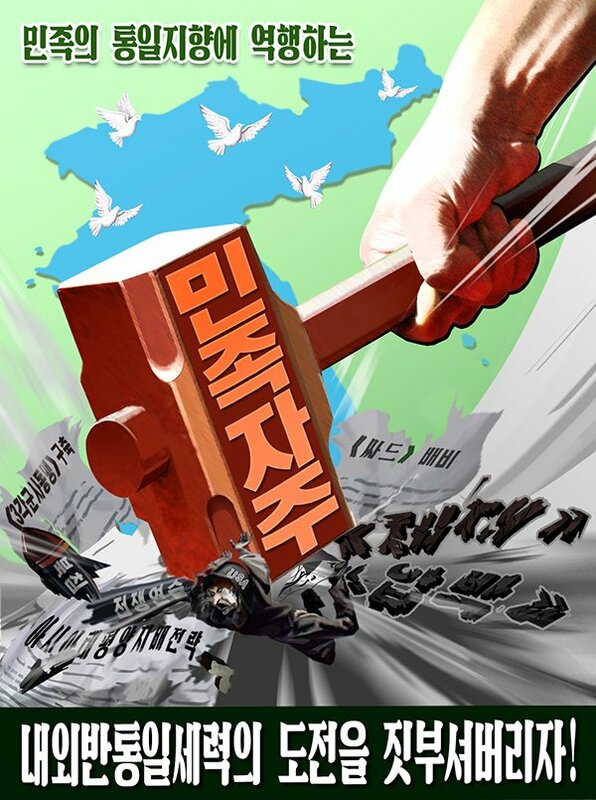 Before that, posters were released in 2017 depicting North Korean missiles destroying the White House as well as the entire mainland United States, while others overtly showed a hammer destroying a U.S. soldier, a paper including the word THAAD, and the words “sanctions” and “pressure” in the same broken font as used in the most recent poster. 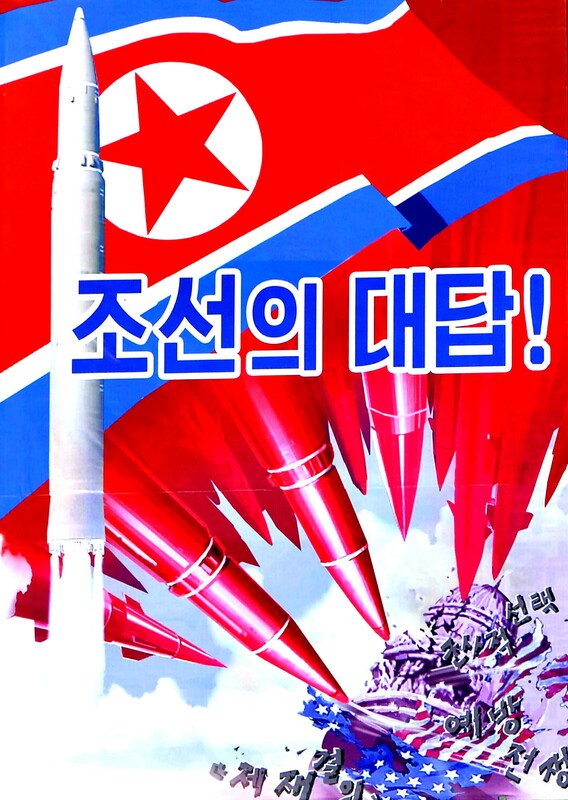 References to U.S.-led sanctions on North Korea were notably absent from the posters released this week, however. 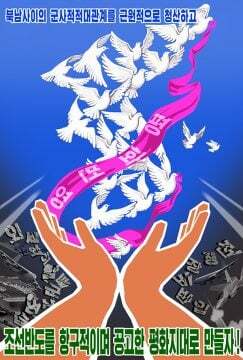 Of the other four new posters, all were themed heavily on peace, unification, and existing joint inter-Korean agreements. 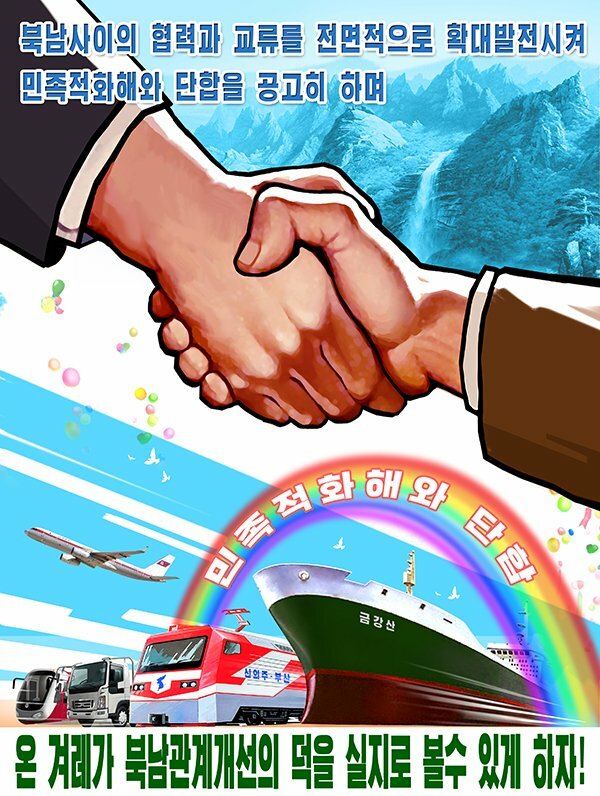 This poster also features possible references to increased inter-Korean trade and exchanges, such as a large cargo ship, an Air Koryo jet, and a train with the words “Sinuiju-Busan” – symbolizing inter-Korean railway connecting the major cities at the northern and southern tips of the peninsula. Tucked away in the bottom corner is also a new subway car design which has been featured in past propaganda posters, but which which has yet to be revealed as a fully-realized project in state media. This may act as a preview for a future visit by Kim Jong Un to South Korea’s tallest mountain, Mt. Halla, following President Moon Jae-in’s invitation to do so while the two stood at the North’s tallest peak at Mt. Paektu last September. 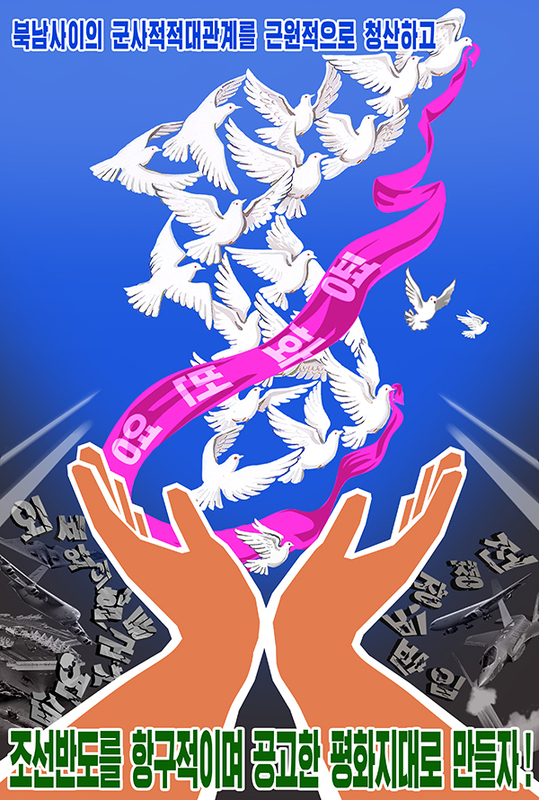 “Let’s actively try to find a peaceful reunification plan based on the nationwide agreements and direct sincere efforts to this end!” the other proclaims. Similar posters were released last year, though this one notably includes the most recently-signed September Pyongyang Joint Declaration and “north-south agreement in the military field,” appearing on the covers of books along with the Panmunjom Declaration signed last April. Meanwhile, North Korea released new stamps last week mostly recycling the economic themes of propaganda posters released last year.